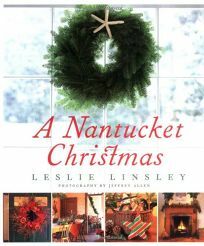 Nantucket, the charming little island off the coast of Massachusetts that's reachable only by boat or plane, is primarily seen as a summer vacation spot, but this festive gift book shows that the New England town can be just as appealing when blanketed by snow as it is in the heat of summer. Linsley (Leslie Linsley's Decoupage, etc.) takes readers on a tour of the island's exquisite 200-year-old homes at their most splendid: Christmastime. Packed with full-color photographs of the homes of the author's friends and acquaintances, the book includes many New England touches, including snapshots of boats and ships, simple shingle residences, shop windows lit up for the season and lighthouses. The author provides adequate historical background information on the buildings, as well as tips for anyone interested in arts and crafts; projects include making a fan plaque out of greenery and citrus fruit and arranging flowers for an elegant centerpiece. Linsley also includes a recipe for a stunning Pear Almond Tart, making this more than just an attractive coffee-table book. The volume can seem repetitive, as many of the homes are decorated by the same designers and floral arrangers, resulting in an endless array of sophisticated white lights, cranberries in glass containers and red candles on the mantel. In addition, people don't figure in any of the photographs, which is a shame; having a few festive faces, perhaps at the many parties and events Linsley mentions, would help display the holiday spirit the author is trying to convey. Still, readers who like this style of decoration will find inspiration in this book, even if it doesn't persuade them to weather a winter in Nantucket. Photos.